The Corn Returns, agricultural data from the 18th and 19th centuries, represent a key resource for historians trying to understand the emergence of modern agricultural markets and the effects of protective tariffs. This lecture explores how the Corn Returns furnished important support for the competing claims of 18th century moral philosophers and 19th century political economists, playing a key role in debates about the repeal of the Corn Laws. D&apos;Maris Coffman is the Professor of Economics and Finance of the Built Environment at UCL and Director of the Bartlett School of Construction and Project Management. Born in Virginia, she grew up in Moab, Utah at the tail end of the Uranium boom and in Denver, Colorado amidst the 1980s Oil Glut and the Savings & Loan crisis. Before coming to UCL, she spent six years as a fellow of Newnham College where she variously held a junior research fellowship (Mary Bateson Research Fellowship), a post as a college lecturer and teaching fellow, and a Leverhulme Early Career Fellowship. 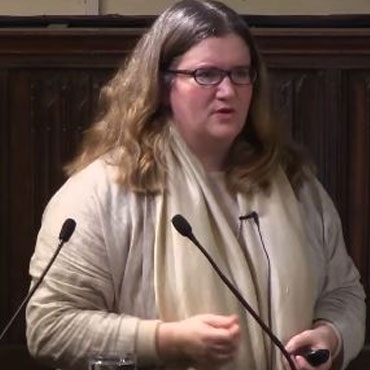 In July 2009, she started the Centre for Financial History in Cambridge, which she directed through December 2014. It is still going strong, but has moved from Newnham College to Darwin College in line with the affiliation of its new director. She did her undergraduate training in managerial and financial economics at The Wharton School and her MA and Ph.D. in History at the University of Pennsylvania. Her current research interests span financial history, infrastructure economics, construction economics, historical property development and climate change economics and finance. Thank you for coming to spend your lunch hour to hear about the Corn Returns and the Corn Laws. I can imagine most of you would probably prefer to be eating bread rather than hearing about the ingredients, but nonetheless, I am here today to talk about the Corn Laws, but particularly the Corn Returns, which is data resource that the British State in the late-seventeenth, eighteenth and early-nineteenth century spent thousands of pounds on a yearly basis monitoring corn markets in out-ports and in market towns in order to enforce the Corn Laws. I hope what I am going to do today is to dispel some of the myths that you might have about the Corn Laws, the idea that these were the result of the Continental blockade or the Napoleonic Wars, and actually to suggest that they are something much more ancient than that, that they were in fact established in the 1690s. They changed form over the course of the eighteenth century, and by the nineteenth century, they played a role in the theorisation of early political economy. To give you a quick overview of the talk, what am I going to do in the next hour: first of all, I think we should reflect a little bit about why we are interested in grain markets at all – why would a financial historian be spending so much time thinking about grain markets? Why would a research centre in financial history go to the vast expense and effort of digitising six million data-points that speak to the price of corn and the quantity of corn sold in the nineteenth century, when surely we could be doing things that are more relevant to financial markets today? Then, I am going to go ahead and give you an overview of the actual historical material: how did English and Welsh grain markets actually work, what are the Corn Returns, what are the Corn Laws, and what are these debates that this data source underpins? But first, with respect to our interest in grain markets, I think it is fair to say that this is an example of the British State making a commitment to evidence-based policy. Quite contrary to what we usually hear about political economy, that the first political economists, who indeed were moral philosophers, but the idea that they were reasoning from first principles, that they did not care about empirics, that this is all about theory, is actually not true. The reality is that they were very much concerned about the empirical basis for their formulations of economic rent, of corn prices, of corn rent, and they had a data source available to them that was financed by the English State with which to reason about these markets. So, it will convince you that not only is early political economy, but also its predecessor, mercantilism, built not just on theoretical reasoning but also on empirical research, and I think that is a very important thing to take away from this because one thing we certainly believe at the Centre for Financial History is that evidence-based policy is essential, and I think there is a much longer tradition of this in this country than people who have been around for the last twenty or thirty years would necessarily be inclined to think. I also want to suggest that the Corn Returns themselves were central to the reasoning of Adam Smith, David Ricardo and of Thomas Malthus, and that we can see that very easily by looking at these debates about the Corn Laws. More than that, grain markets are very relevant to financial markets today. Although agricultural futures contracts represent less than one percent of total futures contracts traded globally, the wheat future remains the peridynamic future for regulatory authorities, particularly in the US, when they are thinking about these markets, and moreover, when Holbrook Working was theorising about the efficient markets hypothesis, long before he looked at equity prices, he was looking at wheat futures in the Chicago Board of Trade. So the notion of futures markets and the spot-markets that underpin them as fertile ground for theorising about futures markets and how to regulate them is something that was true in early twentieth century America and it was also true in early-nineteenth century Britain. So, with that in mind, let us move on to an overview of English and Welsh grain markets, but before I do that, I am going to do one thing – as a diversion, I put this in at the last minute. I wanted to show you actually that Adam Smith does in fact take wheat prices that were generated by the early Corn Returns and actually provides them to you in a table in “The Wealth of Nations”. He does not graph them – I graphed them for you, but he lists them, sequentially, from actually the late-1590s, but in this case, I have showed you the mid-1640s all the way up to 1760, because he wants to demonstrate the volatility of wheat, and he wants to illustrate in his “Digression on Silver” why it is the case that those landlords who received tithes in rent and wheat were largely better-off than those who received them in money. Even as early as Adam Smith, these Corn Returns that I am talking about were very central to his discussion on what is money and what is rent. Before I do that, I want to talk a bit about how British grain markets worked in this period because one thing that must be said about these six million data-points is they still represent only about 25-50% of the total grain bought and sold in Britain in the nineteenth century. We are talking here about market towns, which were heavily regulated. The Justices of the Peace were forced to appoint an inspector. That inspector could not be involved in the grain trade, and that inspector had to inspect the accounts of all of the traders in the market and certify the average price paid and the quantities bought and sold in a given week and to report those to the Corn Commissioner. So, these are heavily regulated markets, but there were also market fairs that were less heavily regulated. They were seasonal, and they generally applied to seasonal crops, but again, these were open markets. Private markets, on the other hand, certainly existed. They were generally over-the-counter. You could buy and sell grain at the gate. There were middlemen involved in these markets, as well as in the open markets, factors and jobbers. We could see evidence, in the seventeenth century, that they actually kept what we might think of as derivatives books, that they had cash settle futures contracts, although, in many cases, these are really just contracts for difference, and of course, some of the contracts were serious and there were concerns about market abuse. So, again, this is not that much different from today, but I wanted to illustrate to you that there is in fact a wider phenomenon of grain-trading in this period, and that the Corn Returns really do only capture about half of it, but there is also very good reason to think that these markets are fairly thoroughly arbitraged. In terms of market fairs and market towns, I put this up simply because it gets at the density, or lack of density, of agricultural markets in different parts of the country, and also of the market fairs, and I think what is the case though is that, even in the mid seventeenth century, these are fairly well-established, because if you look at these, and you can see the regions where they are least dense, and the regions where they are most dense, and you compare that to the nineteenth century, where one of my colleagues, Louise Pryor, has managed to locate the GPS location of all of the market towns and out-ports that the Corn Returns are surveying, you actually see that they are quite similar. What we have been able to do is actually to locate specifically which street corner or which corn exchange these were traded in, so, again, the density is fairly well-established by the seventeenth century, but by the nineteenth century, this has exploded to approximately 400 markets that the State is actively monitoring. It is also again important to say, with respect to private marketing, that it is not as if we did not know about the extent of market abuse in these markets, that we are not able to think about them systematically, because these were largely governed by manorial courts, and the manorial courts allowed complainants to prosecute offences, and what we do know is that actually offences related to the buying and selling of these goods, in terms of contracts and abuses of contracts for difference, actually represented less than about 10% of the total complaints that people had. So, most people were complaining about the quality of what was bought and sold, not about the way in which the market participants were behaving, and that is important later on, in terms of trying to assess the level of fraud around the reporting of the Corn Returns themselves. What we also know is that, even in the seventeenth century, there is an awful lot of corn-dealing outside the region in which the corn is produced. What you can see here is that a significant proportion of the buyers and sellers are living in different counties, even by the mid-seventeenth century, and that, very often actually, up to a third of the buyers and sellers are living in different regions. What we know is that people did actively buy and sell grain from one region to another, and that approximately a third of the people, say, in Norfolk or Suffolk buying or selling grain had actually come from further afield. This is a well-integrated market in that respect and, again, the question is: why would the British State spend the resources it does trying to understand this market? Again, I think the reason for that has significant implications for the way we think about the regulation of financial markets today. But what we know about the Corn Returns is that they were established in 1685 under James II. They were re-established and enlarged under George III. Both of these monarchs have fairly bad reputations for absolutism, for abuse of private property rights, and for other things, but they certainly were concerned about the regulation of the grain trade, and even the initial Corn Returns in 1685 tracked five commodities. Those five commodities were wheat, barley, rye, oats and peas. The reason they chose these is that wheat, obviously, is the key ingredient in bread; barley is the key ingredient in beer; rye and oats are obvious substitute goods, so if the price of wheat is too high, then a poor person is going to go out and use rye or oats instead to make bread; and peas were important because peas were used as livestock feed. So, they tracked these five commodities, the prices and quantities, in the out-ports and the major market towns, and again, by the 1840s, this had grown from about fifteen markets they were tracking up to 280. What they did is they required that the trading factors, the people who they identified as non-retail traders, produce their trading accounts every week for inspection. They had to produce them under oath, and nominated persons, who were appointed by the Justices of the Peace, inspected these, recorded all of the grain that was bought and sold, averaged it on a weighted basis – initially, they had a simple average, and then they shifted to a weighted average – and then returned those weights to the Commissioners. Again, despite problems, there is actually remarkable consistency and accuracy to this. When Dr Pryor assisted with the development of the Corn Returns site, I think we discovered about 98% of the markets returned at any given time, so there is actually not much data being lost in this, and even from the 1690s, this material was being made widely available. John Houghton, who many of you may know in the context of Houghton Street and the London School of Economics, was also the first merchant to be elected Fellow of the Royal Society. He was an apothecary, a grocer, an excise officer, and, ultimately, a newspaperman. What he did was to publish the Corn Returns in the 1690s. He actually published them alongside the prices of various stocks and bonds, and the prices of lumber, timber, textiles, other things that he thought his clients might be interested in, and although this graph I think is not reproducing as well as I might like, what you can see is, actually, each of the areas, Worcester, Windsor, Lynn Regis, Bangor, each of the locations that he has identified in the Corn Returns, he reports the prices of each of these commodities and, in this case, he also reports the high and the low, so that his correspondents can see both how prices vary in different regions and also can make judgements about where to market their own grain. Again, this is one of 583 such price currents from this 10-year period, which means that he is publishing one approximately fortnightly, although there are periods when he does not publish at all because he does not have access to the data or to the paper needed to print his periodical. This is something that happens very early, and it happens because they are interested in enforcing these corn bounties, which I will talk about momentarily, but what I also want to suggest is that it is not – and, again, here is another one which I think is perhaps a bit more readable. It is not just corn, wheat, rye, barley and oats that he is reporting; he is also reporting stock market prices, which he calls “actions”, he is reporting foreign exchange, and he is reporting births, marriages and deaths in various regions. Some people have used these early financial newspapers to argue that people are engaging in portfolio allocation, that they are making choices about whether to invest their money in stocks or to invest their money in agricultural land in order to earn returns on that. I do not think there is much evidence for that, but what I think is important about these is to realise that the data that the British State was collecting was not just going in a chest someplace, but was actually being used actively by the public, even in the 1690s. So, what happens after that? What happens after that is a series of magazines that are directed towards the gentry: “The Gentleman’s Magazine”, “The Universal Magazine”, other such periodicals begin publishing these Corn Returns, sometimes in truncated form. “The Universal Magazine”, for interest, in 1750, thinks that only five of these are of interest to its audience, so as a consequence, it publishes Bear Quay, which is London, Basingstoke, which is Hampshire, Reading, Oxford, Henley and Westminster, because its readership is obviously in the South of England. But the point is that this is very widely disseminated, again, alongside the prices of stocks, which is to say joint stock companies that you can trade in the eighteenth century. So, again, this is not the case that in 1770 something happened and the State suddenly collected this data; it had been doing it for quite some time, but in the 1770s, something did happen in the sense that the Parliament decided that the “London Gazette” should publish this data, and that it should do so officially on a weekly basis, that it would not just be up to newspapermen who thought it might be interesting to their customers to publish it, that it was something that everybody needed to have access to on a weekly basis. So, the 1770 legislation insisted that the “London Gazette” publish the Corn Returns, and, again, they start out with a number of inland counties and a number of out-ports along the coast, and they do it for wheat, rye, barley, oats and beans, and initially, they are publishing just prices. Later on, they decide to add quantities as well, and what we can see is that, by 1831, they have established this in tabular form. It looks identical every week and the data is there for anyone who needs to use it, and it is quite extensive, and, again, it grows to 280-such market towns. The arguments persist about how reliable these weighted averages are or people tampering with them, but all of the research that we have done with this, and also the research that a rival group out of Bristol has done with this, has suggested that they actually are a reliable guide to what was bought and sold in these markets. This is an enormous expenditure of resources on the part of the British State. The idea that you would have Justices of the Peace, who of course are voluntary – they are not being paid – find somebody locally, who is also a volunteer, who is willing to monitor a corn market, without having any stake in it, without being somebody who is trading in these markets, but is just willing to do it out of a sense of civic duty, but is willing to collect all of this data and return it to the Corn Commissioners, who are paid, who then have to process the data and then send it to the “London Gazette”, which then prints this data, is an enormous undertaking! We have come to appreciate what an enormous undertaking it is when we undertook to digitise the results of this, and, again, you are talking six million data-points over a period of approximately a hundred years, 1760 to 1865, and we are digitising it on the basis of the PDFs made available by the “London Gazette”. It was an enormous undertaking. It was paid for by the Institute for New Economic Thinking. Again, it is available for download. We would encourage you, if you are interested in this data, to have a look at it, but bear in mind that, unless you tell us who you are, you can only access ten markets at a time. So, really, if you are interested in this data, please register, please tell us what you want with it, and we would be more than happy to talk to you about it, particularly if you are doing primary research. This is the website, the Corn Returns Online, and you will be able to not only see the maps of the various markets and how they change over time, in cross-section, from 1825 to 1865, you will also be able to do some data visualisation, and you will be able to download it, and you will have some suggestions for extra reading. To give you a sense of what this data visualisation is about, this is, for instance, for a 40-year period in Loughborough, which of course is in Leicestershire. We have got wheat, barley, oats and rye, and what you can see is, on the one hand, these commodities, with the exception of wheat, are quite highly correlated, but moreover that wheat is really quite volatile in this period, the other commodities somewhat less so, which is what you would expect if they were substitution goods. You can do this for every one of the 280 market towns, and if you wish also to compare them within a particular region, or even compare them across regions, you can look at all of the markets in Middlesex or all of the markets in Oxfordshire, or you could compare the markets in Middlesex and the markets in Oxfordshire. You can see, in this case, by the middle of the nineteenth century, these markets are well-integrated indeed, whereas, in previous periods, they were less so. But, you know, this is all available for you and we really do want you to use it – that is why we put it out there, and if you have any questions about it, contact us through the website. We would be delighted to help make it available to you for your own research. But, again, what are we talking about? We are talking about grain markets that are really quite local and, in some cases, quite heavily concentrated. Again, Dr Pryor has found the location of the grain markets, so if you wish to use these to relate them to nearby canals or nearby railroads, as we are doing in some other research, you can. But I think the key thing is to recognise that the State has committed itself to this degree of market monitoring in a period in which doing so is really non-trivial. So what are we doing with this data, since I have suggested there are a number of things you can do with it? The first thing we are doing with this data is looking to see, structurally, what accelerated market integration, because, on the one hand, you have the coming of the canals, canal-mania, you have the coming of the railroads, and the Cambridge Population Group has taken all of the data on the building of canals and has effectively built a model of how the canal network expanded between 1770 and 1820, and we are relating that to the corn prices and corn markets to understand the effect of the canals on market integration of agriculture. We are doing the same thing with the railroads from, say, the 1830s to the late-1850s. We have also got all of the data on the coming of country banks and are able to relate the proximity of country banks to the growth of these markets, and likewise with post offices. So, we are beginning to explore structurally what actually underpins the progress of British agriculture in the early-nineteenth century. The question is: why does this matter? The reason this matters is that one thing that still has not been satisfactorily explained is: why is it that the population of Britain in the 1760s/1770s was still hovering around seven to eight million people, whereas, by 1850, it had grown to over 22 million people? So, in the space of a couple of generations, you have got massive population growth. Thomas Malthus and others were predicting population implosion. They were predicting what we call a Malthusian crisis, that this would collapse. It does not collapse. Instead, British agriculture proves up to the task, proves it is able to sustain that kind of population growth, and what we are trying to do is understand why. Part of it is to understand what happened structurally because, before you get into debates about whether or not the Corn Laws helped, whether or not protecting British agriculture was a good thing, it is first necessary to understand structurally what is going on in the economy. So, we have identified those as the main structural factors, and if any of you have any other structural factors you would like to suggest, by all means raise your hand and let us know. Again, we are ultimately trying to explain the different trajectories, because we know that something very different happened in Ireland. We know that Ireland actually experienced a Malthusian crisis. A million people died. Irish agriculture was not self-sufficient and Ireland did not recover its population until the 1960s, whereas England actually prospered in this period, so understanding that is important. But also, it is necessary to ask whether or not this regulatory regime benefited the agricultural sector at the expense of the industrial one, and given the difference in agricultural prices and industrial prices, which I will show you a little bit later in the talk, if you believe those numbers, it is a wonder that Britain industrialised at all! And if you believe what the Anti-Corn Law League was saying about the way in which the Corn Laws represented a tax on industry, it is a wonder that Britain industrialised at all! So, there are some really important empirical questions that have to be resolved, and digitising this data is the only way to go about doing it. More than that, this is also a case study in big data because, if you think about the way economic history is done, what generally happens is you have got a graph like the one I showed you in Adam Smith, where you have annual prices of wheat from 1595 to 1660, and you have, at most, a couple of hundred data-points, you do a number of regressions - yes, you have tools available now to do multi-variant regression analysis, but it is really very simple compared to asset prices. This dataset, the Corn Returns, with six million data-points, is getting closer to big data, but it is big data in a very constrained way and big data in an historical way. So, what we are beginning to think about doing is how you can use machine learning tools to understand the structures that we believe exist in these markets, and if you can do it for data on the nineteenth century, then there is reason to think that it might be useful for data in the twenty-first century. So, this is a kind of a laboratory, a testing ground, to see whether these machine learning tools are actually appropriate for thinking about these kinds of markets, and the hope is that you might be able to apply them to different markets. So, there are methodological issues as well. Finally, there are these classic debates in political economy that need to be resolved, and actually, the only way to really do that is to look seriously at this data because the participants in these debates thought seriously about this data. In terms of agricultural versus industrial prices, if you believe this graph, it is very hard to explain why the Industrial Revolution happened because industrial prices are considerably lower than agricultural prices. And all of those merchants who wished to see the Corn Laws repealed are insisting that the Corn Laws represent a tax on them because, if agricultural prices are this much higher, then the food that their labour has to buy will push up wages, and that, effectively, what you are doing is transferring the profits of one sector to the profits of another. So, it is important to understand whether or not this is correct, and if it is, what explains then the motive for industrialising at all, and in terms of the terms of trade, whether this is actually plausible or not, because, again, what this suggests is that increases over time, which is very difficult to explain if you assume that these are frictionless markets. Let us think again about the Corn Laws and go back to their infancy. They date from the 1690s. Actually, there was a momentary attempt even in the 1670s to impose them. They are not the product of the Napoleonic Wars, which is what you read about in school. They tell you, in school, that you have a continental blockade, all this marginal agriculture gets put into production, the gentry are making out like bandits, the Napoleonic Wars end, the gentry do not want to lose their economic rent, so they lobby for Parliament to keep the Corn Laws. That is not the case. The Corn Laws date from the 1690s and they were initially used to address a very different problem. They were a deliberate attempt by a House of Commons Committee, which was one of the subcommittees of the Royal Society, to get people, particularly the gentry, to invest capital in domestic agriculture, and they did that by guaranteeing a form of price support. They were also, at the same time, meant to help consumers because, after the English Civil Wars, it became very difficult to enforce the assizes on bread and beer because these assizes had fallen by the wayside during the 1640s and 1650s, and re-instituting them in 1660 was very, very difficult in practice. So, it was an alternative to having assizes on bread and beer. Assizes are price controls - the maximum price you can charge for bread and beer. The idea is, actually, we will not do it that way; what we will do is to try to reduce the volatility of the underlying prices of grain. So, what they did is they ended up imposing tariffs on imported grain, as well as export bounties on domestic grain that was exported to the Netherlands, in the first instance, with the idea that this would provide price support for farmers, and it was so successful that, eventually, the export bounties eclipsed the revenue from tariffs, which posed a significant problem for the Treasury because, by the 1720s, the Treasury was paying out more in export bounties than it was taking in in tariffs, and the question was what to do about that. This also had implications for international competitiveness, and, again, people who would defend mercantilism in this period use the example of the English malt trade because what happens is these export bounties encourage the export of English malt and eventually it kills off the Dutch malting business and all Dutch beer uses English malt in its production in the early eighteenth century, as a consequence of these corn bounties. So, they actually do matter in terms of international competitiveness, but in the first instance, they are really done to reduce volatility and to discourage speculation in corn markets. Again, this is initially because they want to be able to set the correct tariff. If you are going to have a tariff schedule that disappears as prices rise, then you have got to be able to monitor these prices. So, choosing twelve ports and monitoring the prices in the ports, and monitoring the prices in the most proximate market town, is a way of adjusting your rate schedule should you find that the price is either increasing or decreasing. Of course, what John Houghton is trying to do is to point out to people that prices paid in one port may be rather different from prices in another port and that it is possible to either arbitrage these or to think seriously about why these differences have occurred. They are also, at the same time, not just used to monitor whether or not the corn bounty’s rate schedule is being set at the correct level. They are also used, at the same time, to judge the effects of changes in the excise rates on agricultural prices. Now, you may ask: what is that about? I just said that the reason you had the corn bounties at all was to help consumers, given concerns about the prices of bread and beer. Beer turns out to be a big part of household budgets in this period, and there is a very big concern about what the fact of the price of barley does to the price of beer, and also whether or not changes in the excise rates on beer will increase the price of beer for the consumer or whether it will decrease the price that brewers are willing to pay to farmers for their corn. So, the excise actually turns out to be economically very important, and, although we do not yet have a theory of tax incidence – that is something that really comes out of this period in the early eighteenth century: the State is very concerned to tell whether or not raising the rate, raising the duty, has a bad effect on consumers or a bad effect on farmers, and the only way to do that is to measure these prices through the collection of this corn data. So, it is also about taxation as well as about tariffs. I hope it comes as a surprise to most of you to know that even the seventeenth century State was worried about the effects of its tax policies and its tariff policies on the economy, though this is not something that comes out of the second half of the twentieth century, but finally, it is used to mediate debates about the repeal of the Corn Laws in the nineteenth century because the time the early nineteenth century rolls around the reality is that these price supports are very rarely kicking in. The prices never fall to the point where it is necessary to close the ports to imported grain, and actually, in most cases, by the time you get to the 1820s and 1830s, these tariffs are not kicking in at all, and imported grain is imported tariff-free. So, in a sense, the Corn Laws are eventually repealed because they become a dead letter, but the only way you know that is because you manage to monitor these on a weekly basis. To come back to this question about the Corn Returns and the excise, I think, again, this is an enormous undertaking on the part of the Government to monitor corn markets with the idea of correctly setting tax rates. What’s going on here? Gregory King, in 1695, identifies it as the largest household cash expense for the poor and middling sort, and he in fact actually is able to estimate how the average household spends its income. Gregory King is looking at this very simple wage-earner that makes five shillings a year. He is looking at it for a middling income family that makes 25 to 50 shillings a year, and then he is looking at it for more wealthy gentry families. But this snapshot is extremely important to economic historians because it is the only evidence we have of how households consumed in the seventeenth and eighteenth century. What you can see here is actually ale and beer represents the biggest single household expense, far more than bread, which is the blue chunk, and much more than meat, for instance, or wine and spirits. Beer is that very large chunk. Knowing that, what the State recognises is that only the very well-off could afford to brew at home, so only very rich people are avoiding buying beer that is subject to taxation. So, this produces periodic calls for taxes on malt and taxes on hops because the idea is that it would be much more equitable for the State to tax the ingredients of beer, because that would tax the gentry families that were brewing beer as home, as well as the poor people who are buying beer on the street. The question then is: how do you decide whether or not that is a good idea? The way the British State decided that that was a good idea was to observe whether or not changes in the excise rates on beer affected the price of beer or whether they affected the price of corn, and they actually did this in the 1690s and that led them to introduce a malt tax, and then, in the 1710s, it led them to introduce a hops tax. Again, they know that beer production assumes a significant proportion of agricultural produces, up to 50%, and although they debated the effects of this very fiercely and very seriously, they always did it with reference to these corn prices. They always came back and said that this is because we know that this has had this effect or had that effect. I think this is very interesting because this is not how we generally think about mercantilism. We think about mercantilism as the king’s friends telling him that the way in which a state thrives in this period is to have a positive balance of trade, to have a lot of treasure in its chest. We do not imagine that the mercantilists were out there measuring the price of grain and using that to argue that you need to change your tax mix in order to be fair to the poor or fairer to the landowners. This opens up a whole world on what this early political economy looks like, and it turns out that it is not nearly as strident and not nearly as simple-minded as many people like to assume. But we also find that, very early on in the eighteenth century, the people who were looking at this corn data made a distinction between the legal incidence of a tax, which is to say who legally has to pay the tax, the idea that this tax falls on the brewer, and the real incidence of the tax, which is to say does it fall on the wage-earner, does it fall ultimately on wages, does it fall ultimately on consumers, does it fall ultimately on farmers? That is a very sophisticated argument, and one that is very often lost today when we talk about taxation because, today, we tend to assume that either the legal incidence of the tax is the incidence of the tax, or we assume that you have a perfect equilibrium condition and that taxes always fall on wages, whereas they were aware that both wages and prices had friction. They did not use the word “friction”; they talked about them in terms of not being able to shift very quickly, and they recognised that the stickiness of this might create inequalities and they wanted to address those. So, again, this is a commitment of resources to monitor prices, with the idea of thinking more widely about policy. If you can do it in the eighteenth century, I would like to think you can do it today, and hopefully what you are hearing from me today is a call to encourage not only our policymakers and our legal representatives, but also academics, to think more seriously about the real effects of these policies rather than the theoretical ones. Viewed from a grain merchant, even in 1694, this guy is going on about the fact that you have had, after King William comes to the throne, both a double and a triple excise tax, and what he has done is looked at the data and said, actually, the effects on this are very, very bad for the farmers and ultimately also very bad for the Treasury, and he ends up being correct. But the interesting thing about William Stockton is he is also somebody who made a fortune in the 1670s speculating on grain prices as a result of the changes in the excise duties, and speculating on grain prices in anticipation of bounties, so these guys are very, very clued-up about these markets. So, again, I have shown you that. We know that the Corn Returns fuelled the debate because they were used to decide whether or not you should open a port, what tariff was chargeable, and what, if any, bounty might be paid. We know, by the nineteenth century, that they are widely reported in local newspapers, because one problem with the Corn Returns when these were first discussed in the 1970s is that some scholars said, “Oh, that’s all well and good, but who subscribes to the “London Gazette”?” Well, it turns out that not many people subscribe to the “London Gazette”, but everybody subscribes to their local newspaper, and the local newspaper reproduces, just as I showed you “The Universal Magazine” did, the Corn Returns for the counties in question, so these are very highly disseminated. It is hard to imagine that a literate person in nineteenth century England would not have had contact with these, just as it is hard to imagine that a literate person in the 1980s would not have had contact with listings on the New York Stock Exchange because they were on the back of every paper in the Western world. Corn factors and industrialists used them to argue for the repeal of the Corn Laws. The corn factors were essentially saying that the artificial manipulation of prices at this point was indefensible, industrialists were saying that this represented a tax on them, whereas, farmers and landowners used to argue for their continuance. Again, this is very often seen simply as the debate about economic interest. The assumption is that industrialists want cheaper food, farmers want economic rents, and it is very rarely that we take seriously the fact that the people who are making these arguments are actually relying on the price data to do so. But I think the most important debate about political economy in this period, and the most important formulation of the debates about the repeals of the Corn Laws, was this rather famous debate between Malthus and Ricardo. What is very interesting about this debate is that it is not just about whether or not you should repeal the Corn Laws. Malthus and Ricardo, by debating the Corn Laws, arrive at different concepts of economic rent. Ricardo ends up arguing that rent is in fact the residual value in excess of the production value. So, he is able to calculate what he sees as that residual value, and he is able to do it – he has got this corn price factor model – he is able to do it because he is able to go to the newspaper every week and to see the fluctuations in these prices and to calculate an average residual value over time and to argue that that is theoretically sustainable. Again, it is not purely a theoretical argument. It turns on movements of prices and rents, and the thing that they are able to do, because they have this corn price data and they also have, in Ricardo’s case, rent records from his own estates that go back into the eighteenth century, they are able to see that agricultural rents in this period are increasing much faster than prices. You have price volatility, but you do not have a lot of price inflation; whereas you have a massive increase in agricultural rents over the late eighteenth and early nineteenth century, partly as a result of population growth, but partly for other reasons as well. It is very easy, looking at this data, for Ricardo to say that it is this residual that is the issue because rents are increasing much more rapidly than prices. Now, Malthus, on the other hand, essentially adopts the version of economic rent that you see in Adam Smith, and eventually comes around and admits, a few years later, that he thinks that Ricardo was right. But I think, today, what we would say is they are not exactly debating the same thing. They are not debating the same thing in that these two theoretical positions are not talking directly to each other, but what is interesting is that they are arriving at these two different formulations of rent by looking at the same datasets. Ha-Joon Chang sees the Corn Laws as responsible for the Industrial Relation, but is very clear that many of his contemporaries disagreed, and again, they disagreed because they believed that this is representing a tax on the industrial sector, and, moreover, that the effects of the Corn Laws are felt most in the regions furthest inland, in the Midlands, where industrialisation is most heavily intensified. So, you have got this Malthus versus Ricardo debate, but that is only the first of these debates. I think the much more interesting one, in terms of political economy, goes beyond the Corn Laws to this question of the commutation of tithes because this is the really serious issue for political economy after the Restoration. It is a serious issue for Smith in the eighteenth century, and it is one that Malthus and Ricardo are also trying to get to grips with, and that is: what do you do with the fact that, in ecclesiastical lands, 10% of the agricultural produce is gone over to the Church? You have to tithe 10% of produce of the land to the Church, and in the case of the ecclesiastical land that changed hands under Henry VIII, or changed hands under the 1640s and 1650s, under Parliament, then that tithe has to be made to private landlords. So, Adam Smith’s long discussion on his “Digression on Silver” is designed to point out that those landlords who receive tithes in produce, or rent in produce, are much better off than those receiving them in money. It was accepted, from the 1660s onwards, that this system was actually quite unjust, that it was preferable to commute these tithes into a monetary equivalent, but they could not figure out how to do it. From 1660 to 1836, there are these constant calls to commute these tithes, but it is not at all clear how you would go about doing it, and, eventually, in 1836, after the great Reform Act, this is forced through Parliament and the commutation of tithes begins. It takes 50 years to renegotiate all of these contracts in such a way as to make it possible to convert the tithes to money, but they do it because they were able to appoint commissioners to commute these tithes, and they do it because they have access to these Corn Returns and they are able to actually estimate what is an equitable commutation. Without access to these Corn Returns, there would have been endless squabbling about what was equitable, but if you could go back and look at this for the last 50 years, because it had been recorded in the “London Gazette”, it was easy to make your case. What they were surprised to discover is that the vast majority of these commutation negotiations were resolved privately. They did not even have to involve the commissioner because everybody accepted what these prices were, they knew where to find them, and it was not necessary for the commissioner to get involved and to negotiate the equitable amount. So, these played a really key role in the last dismantling of the manorial system in Britain because people were able to accept that these were reliable and transparent, and were able to use them as a basis for private negotiations. I think it is the case that this is influential not just in Government policy but also in resolving what otherwise would have been extremely contentious private disputes. So, again, this is critical because agricultural rents are increasing in this period vastly faster than agricultural prices. We saw that there is volatility in agricultural prices, but there is nothing like the vast increase in agricultural rents. So, what conclusions can we draw from this? I think the most important conclusion is that this is an enormously expensive and extensive undertaking by the early modern State, that, even in the 1690s, this was costing tens of thousands of pounds a year for the English State to administer, and when the average London family makes £50,000 a year, that gives you some basis for estimating what kind of expense this represents. They were used initially to regulate the corn bounties, but the data was, in the eighteenth century, mobilised for a range of other purposes, most importantly to resolve what was equitable with respect to excise taxation, but, equally, they were useful to people who subscribed to these gentlemen’s magazines and universal magazines in order or estimate and understand where best to market their grain. They were consumed widely, and they were used in the 1760s to effectively ban the distilling of corn because you also had periods of dearth, the 1760s being the most extreme one, where the State was able to say that the distilling trade is contributing to corn, wheat and barley being so highly priced that people cannot afford them, so they actually banned corn distilling for a six year period before permitting them again. So, they are widely used in the eighteenth century, to mediate a range of social policies. They are crucial to furnishing empirical support for debates about the repeal of the Corn Laws because, without recourse to this data, it would have been very difficult to establish the extent to which this argument about it being a tax on manufacturing was correct, but more importantly, it would have been difficult to establish that it was essentially a dead letter by the time of its repeal. Likewise, it proves critical in the commutation of tithes, so it is used in an entirely different context even after the Corn Laws were repealed. What is interesting, today, is that you can still find the Corn Returns, but today, the British State is not collecting the Corn Returns. The HCGA, which is the cereal-growers association, is collecting the Corn Returns, and they are doing it in precisely the same way as they were doing it in the nineteenth century, and you can actually go online and see this series extend from 1914, when it stops being published in the London Gazette, on through the present. So, it is not just 100 years of British agriculture, or even 200 years of British agriculture, it is now pushing on 350 years of British agriculture that is being tracked through a mechanism that was established in 1685. Hopefully this will make you re-think political economy. The next time you pick up Adam Smith, and the next time you pick up David Ricardo or Thomas Malthus, recognise that they are not just reasoning from first principles. The classical political economy is not just moral philosophy. Certainly, it is that, in the sense that they had different ideas about what economics is supposed to do and how you interpret it, the theoretical formulations they made, but they were not just reasoning as if empirical data did not matter. They knew empirical data mattered, and the reason they had a corn market model was not just to simplify for the sake of argument, but it was because the corn market was what you had data for, and that is not what we believe about political economy. What we believe about political economy is that this is a type of reasoning that has been completely disregarded by modern economics, that modern economics has gone over to probabilistic thinking, has become obsessed with empirics, and has lost that theoretical and moral route, and what I want to suggest is that, yes, moral philosophy matters, but, likewise, so does the empirical side, and it matters because that empirical evidence was available to the people who first did this kind of thinking at all, and, again, hopefully that is the most important message you will take away from this.